I was born and bred in Memphis. My father died from cancer in 1929 when I was six years old. They called it yellow jaundice, which is cancer of the liver, but he never drank a drop of liquor. At that time, they did not have penicillin — sulfa drugs were the best they had. Fortunately, I had a very strong mother. She worked as a secretary at the University of Tennessee Medical School and taught Sunday school at LaBelle Haven Baptist Church. There were three of us children. My grandmother took in sewing and such to help us, too. We grew up in South Memphis, and I attended Lauderdale Grammar School. Back then, first grade through the eighth grade was grammar school. I did all right in grammar school. We weren’t bad … but we weren’t 100 percent good! We just had fun. A company in South Memphis called Pioneer Pole & Shaft Co. made stilts. But they also turned drumsticks out of hickory. A friend of mine gave me a pair of drumsticks. For some reason, they just fit my hands. At the corner drugstore, where I worked as a soda jerk and delivery boy, they sold cheese in big tin cans about 20 inches in diameter and maybe 4 inches in depth. They gave me one of those empty tins, and that was my drum for a while. My dad was a public accountant. He kept books for the Melody Music shop, Dinstuhl’s candies, and others. Melody Music was on Madison between Main and Front. A lady at our church sold Mother a small snare drum for maybe $5. About six of us formed a rinky-dinky dance band. I remember we played at the Nineteenth Century Club for $4 apiece for four hours. After I graduated from South Side in 1940, I worked for Retail Credit Company. I rode a bicycle all over Memphis delivering delinquent bills. By September ’41, I had saved up enough money to start what was then Memphis State University. I went to school in the morning and still worked at the Retail Credit Company. That December, Pearl Harbor broke out. I signed up for Naval Air Corps training. There were so many who signed up that it took a year and a half before I ever got my call to go. I was within three months of getting my wings when they found out they had too many cadets and not enough planes. I was disappointed, but I was fortunate that I had had two years of college. That enabled me to go to pre-midshipman school, get commissioned, and go out on an LST-461 in the South Pacific. I got out of the Navy in ’43 or ’44 and my brother had graduated in forestry. Forestry was getting specialized. I took wood utilization because I was interested in the tree after it was cut down: whether to make it into veneer, lumber, or plywood; the strengths of the different woods; and so forth. C.M. Gooch Lumber Co. is where I got experience inspecting lumber, scaling logs, and that kind of thing. 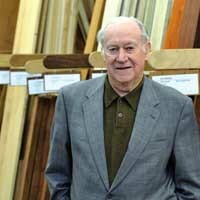 I went into business with my brother Bob in 1961: Colco Fine Woods & Tools. Anyway, she agreed. We went to Rosa’s house for popcorn and Coca-Colas. I was very much attracted. Very much. When I found out she was a home-ec teacher and could cook — well! Now happily married for 55 years. After I opened up the business, I got interested in handball. My buddies were younger than me and were getting better than me, so I thought I’d better start running to gear up my wind. I got interested in triathlons and did a couple of marathons. I competed in swimming in the Memphis Senior Olympics last year that qualified me to go to Nashville to the State Senior Olympics. I qualified there to go to California in August to the 2009 National Senior Olympics, where I will swim in six events: three breaststrokes and three crawls. This is my first National Senior Olympics coming up. I’m afraid to get too excited because I have checked the finishing times on the last Senior Olympics, and they are way ahead of me! So I have changed my goal. My goal is not to place first, second, or third; my goal is to not come in last! The attack on Pearl Harbor changed the way I felt patriotically. I signed up immediately. Of course, I still think about it. But it did teach us that we can’t take it for granted like we did back then — it was very haphazard the way we were defending Pearl Harbor at the time. I hate it when people don’t have an open mind, when people are not tolerant of different races. I knew I had it made when … That never happened. The only thing I can say is I know where I’m going when I leave this Earth. I have that confidence. My experience as a business owner taught me that you need a rainy day fund and you need to recognize the capabilities of the people who are under you, because quite often, they’ll surprise you at what they can do. Back in the day we didn’t lock our doors at night, and you knew your neighbors. If you needed a cup of sugar, you went next door and borrowed one. The most important thing in life is a continual Christian climb. The key to my long marriage is mainly because I don’t hear too well! When I see (hand mimics a gabbing mouth), I just nod my head. During the Great Depression there were bank failures, the stock market crashed. The tough times, we kind of joke about now. Children and the younger generation may get tired of us telling stories of back then, but it has some effect on us, on our children. My first love was the drums. Being a Christian is to be on a continual journey. It helps me in my everyday life. I’ve been real blessed. Every day, I get up real early — 3:30 or 4:00 — and I read four pages of my Bible, then I get on my knees and pray. I get on the floor and do my floor exercises, then I go over to the swimming pool and swim. Then the best part! I jump into the hot whirlpool and get relaxed. I’ll never understand computers! I don’t understand why people don’t get another kind of job if they don’t enjoy what they’re doing. Why people don’t exercise. There are a lot of things I don’t understand. Being a Boy Scout was very important in my life. I joined when I was 12 and was very susceptible to poison ivy. The treatment back then was calamine lotion. I remember in the eighth grade giving the class president speech my mother had written for me, and my face was covered with white calamine lotion. I don’t remember much about the speech. My first memory had to be in kindergarten at Lauderdale Grammar School. Milk at that time, you plopped out a cardboard piece and you drew circles around it for art class. Everybody had their own little mat — a small rug that you laid down and took a nap on for 30 minutes. Most people want somebody to listen to them. Over the years, the lumber business has changed. Sawmilling back then didn’t have modern equipment. We graded lumber, and a mule pulled a so-called dolly up to the loading dock, where we shoved the boards into a boxcar, board by board. Now everything is done by a forklift. I want to be remembered as one who helped when I was needed. If I had a magic wand, I would wave it over the world and have peace and friendship. It would really have to be magic. The best Christmas ever was the year I wanted a new drum, but I knew Momma couldn’t afford it. But the next day, under the Christmas tree, was an $18.50 parade drum, and man! I just went delirious. Mother wondered if the neighbors were going to come in and stop the racket I was making. That was in the 50-cents-down and 50-cents-a-week payment plan days. The greatest joy is having part of heaven here on Earth. At my age it’s important to look to the future. At 86, I’m thoroughly happy. I enjoy my age, I kid about it. I’m blessed with good health. I became interested in swimming when curvature of the spine started creeping up on me and made it difficult to run. I was only in my 70s. My next athletic event is a triathlon in May where we defend our first place rank in the Golden Senior Olympics. I'll swim; my store manager will bike; and a buddy from Atlanta will run. To be in that bracket, the three of you have to add up to 180 years old. At 86, I make a large contribution! My final 2 cents is that I appreciate you coming here.